Looking for the healthiest, yummiest and best cafes and restaurants to eat at in Sydney, Australia? I've got you covered. I've picked out my favourite eateries in Sydney when you're looking for a healthy breakfast, lunch or brunch. These cafes and restaurants consistently deliver some of the most glorious, healthy meals and great coffee - as you can see from my Instagram pics! Beyond the view of Bondi Beach, Porch & Parlour consistently serve up delicious whole food dishes like my favourite, the Green Breaky Bowl. Catch up with a friend for a walk along the beach then finish with breakfast here. Your body will be grateful. Whenever I am at Bondi Junction, you can be sure I am sitting down to a meal here! Not only do I adore the seasonal, whole foods approach fostered by the awesome chefs (Guy Turland and Mark Alston = legends), but the food is really delicious. Pick from the daily selection of seasonal salads and add a protein of your choice. Or choose from the menu. Either way, you can't go wrong. Recommend you give this place a try! Healthy, fresh food without the pretence? Yes please! The menu at Nelson Road Tuckshop is a quirky take on the classics with many healthy and fun ingredients finding their way into your dish (like plenty of fermented veg!) I love how unique and varied the dishes are... I could come here daily and still be excited! When you're working hard and need the right kind of energy to fuel you through, look no further than Soul Origin. I love the convenience of this place. 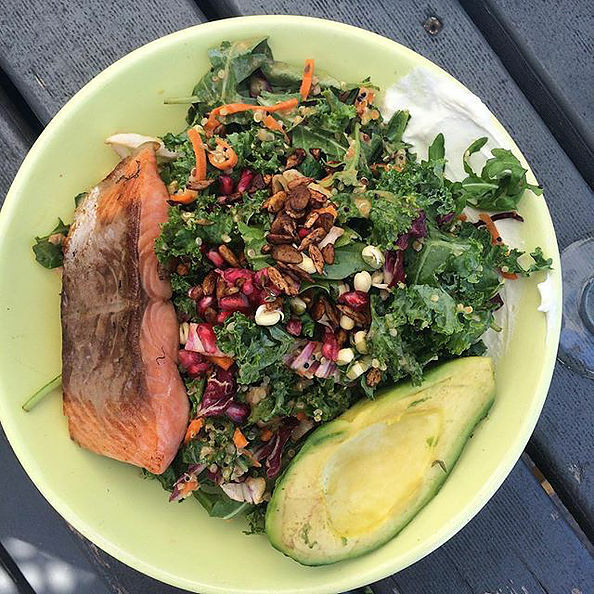 This healthy fast food chain is totally changing the way we eat food on our lunch break. Pick from one of the seasonal salads loaded with lots of the good stuff. Tash Oakley is also a fan of this spot when she is visiting Sydney and I get why. It's a bustling spot on the weekends but lovely and relaxing on a weekday. I'm often popping around to grab a coffee, juice or bite to eat from the seasonal menu. Oh, and if you are super trendy/hipster and like Kombucha - they serve in on tap. This is by far, my favourite place to come for healthy take-aways. They may Poke, a Japanese/Hawaiian style of fish that is served with sides like edamame, zucchini salad and pickled veg - along with black rice and cabbage. I frequent this place pretty regularly because I trust the food is fresh and flavourful. I'm never wrong. Disclaimer: This place is pretty trendy... Though it's tricky to find a seat, the wait is worth it for the experience of sitting on the pier eating from their delicious, yet small, menu. Ideal for a Sunday lunch with your nearest and dearest, followed by a dip in the ocean. If you can't make it out to Palm Beach, there is also the Shelley Beach or Balmoral Beach options. This relatively new kid on the block has created quite a reputation for itself. The food, look and feel also reminds me of a New York Deli but with a healthy Sydney twist. If you're keen on good coffee and cool healthy dishes, this is the spot for you my friend. This 'deli diner' may just be one of my favourite spots to eat in Sydney. It may be the seasonal salads, yummy bagels or the New York deli vibe of the joint - but I'm a big fan. Whilst my hubby can't go past the Rueben, I'm either picking the smashed avo (it's like... wow!) or one of their beautiful salads with some fish for protein. Israeli style eatery (Ottolenghi fans will love this spot!) worth visiting simply because of their Shakshuka or eggplant with pomegranate. Marvel at the jars of fermenting veggies along the walls and feel the love of food at this spot. This is my kind of food...! Each day, five seasonal salads are created at this lovely and light eatery. You can pick a few salads or stick to one. You also have the option to add a protein of your choice. Whilst they also have other options, I've never needed to order beyond the constantly evolving and always delicious salad menu. Note that they often sell out of salads because they are so good - so don't plan a late lunch! It's worth waiting in line for this food. The menu has all the usual suspects but with a twist. Oh, and it's got such a cool vibe - Ideal for a weekend brunch with friends. When you can't find a seat at The Grounds of Alexandria, then make sure you walk 10 metres to The Potting Shed. Particularly good for a night time feed, (but breakfast and lunch are also winners) this spot has a resident parrot as concierge, offers jugs of cocktails that hang from the ceiling and the menu is on point too. Nuff said. A small little cafe in with delicious coffee a yummy rotating menu of healthy options. Perfect for when you want something on trend - but aren't prepared to wait in a queue for coffee. This place has become a landmark in Sydney's cafe scene. When it's too busy to find a seat (pretty much a certainty), visit simply to pat the farm animals, sip a freshly made lemonade and soak in the buzz. Perfect for a healthy work lunch when you're in St Leonards. This place gets pretty busy on a weekday - and with a delicious salad menu, it's easy to understand why.